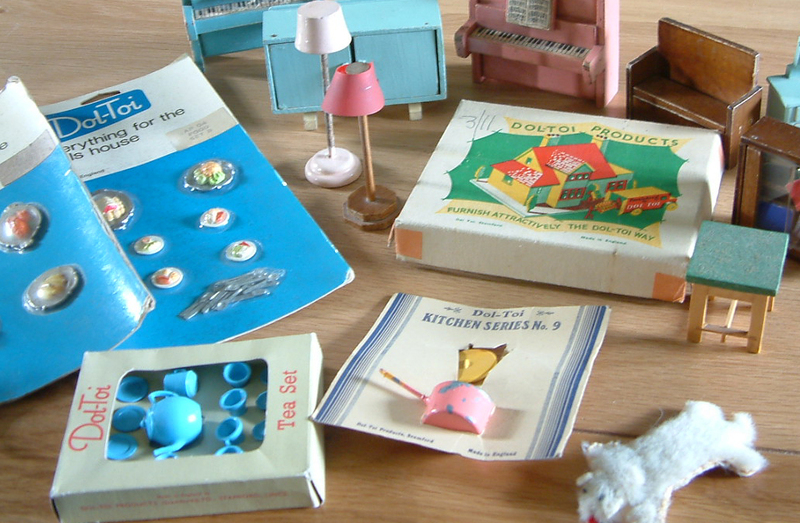 Think oodles of character, think old fashioned....think nostalgic! It will be taking place in the classroom block at Waterperry Gardens in Oxfordshire. 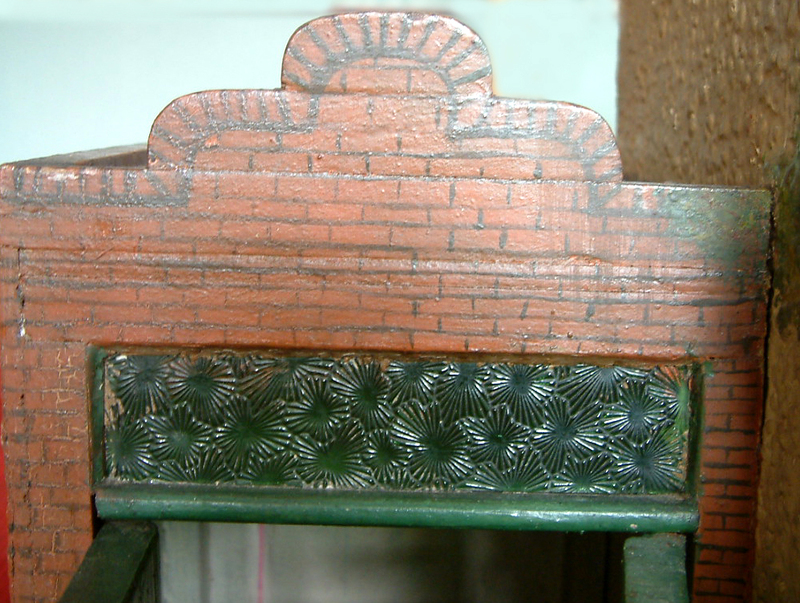 We will be making a vintage miniature scene to include an old arbour (of course) clothed in climbing plants, a wooden chair, stool and table with accessories. Simple landscaping can be enhanced by some individual touches....in our typical Nostalgia In Miniature Workshop style!! 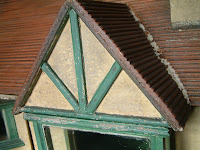 It will be great fun and an absolutely unique project, offered as always in both 1/12th and 1/24th scale. Suitable for beginners and the more experienced miniaturists alike.....you will be assured of a very warm welcome. 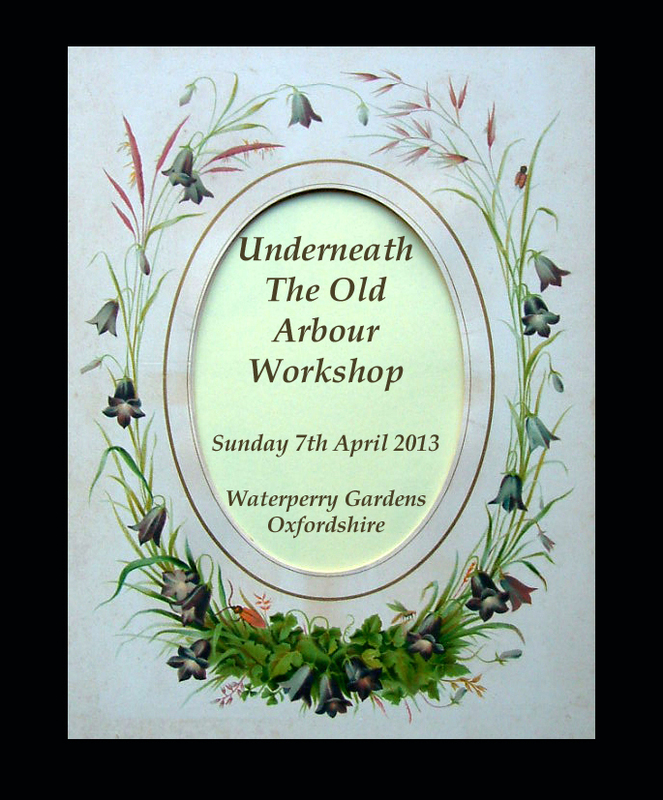 We pride ourselves in that our workshops are friendly, informal and relaxed. 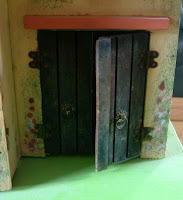 If you participated in one of our 2011/2012 projects from the "Little Garden Series" of workshops then this project will have a base of the same dimension as those and would complement them perfectly. However, even if you have never even been to one of our workshops before this project would also look amazing standing alone or butted up against a reproduction or even vintage dolls house. Waterperry Gardens is an amazing venue in itself with wonderful gardens, garden centre, gallery, gift shop, old church, musuem etc......plus a lovely tea room. Well worth a visit in its own right. At long last we can bring you a short video of the little project that we'll be making in our all day Christmas Special Workshop that is being held on Saturday 24th November at Thame in Oxfordshire. WHEN FATHER PAPERED THE PARLOUR....THE WEEK BEFORE CHRISTMAS WORKSHOP! You will need your speakers on to hear the song! 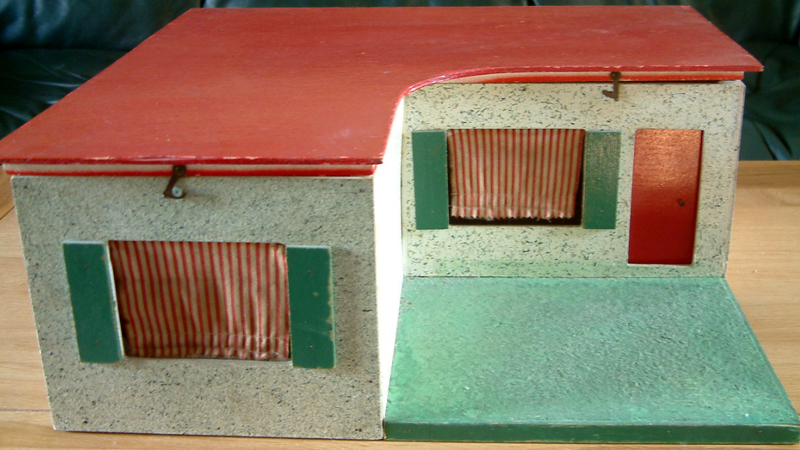 This is a unique miniature scene being offered in both 1/12th scale and 1/24th scale, as always. 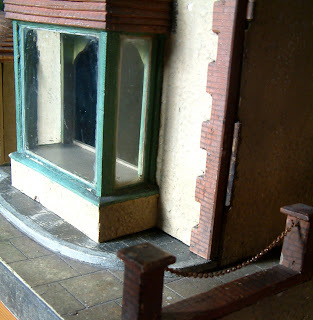 Included in the project is a scratch built Edwardian fireplace with mock tiles, old fashioned kitchen table, pasting bucket, brush, an old crate for father to stand on in order to reach the top bits and a Reckitt's Blue crate with old Christmas decorations spilling out. Attendees will be making their own wallpaper too, be shown a very different way of creating mock floorboards and a few more bits besides.......will be great fun to do! We can squeeze up to 4 more people in if necessary but you will need to contact either me or Robin asap. Please click on following link for full details including a downloadable booking form. Some Rather Lovely Dol-Toi Dolls House Miniatures! Listing has begun of Marion Osborne's Dol-Toi Collection (see previous post). These lovely items seen in the photo above went up for sale over the weekend....some have already been sold....sorry. I meant to put a posting on here before now but you know how it is.....there are not enough hours in the day sometimes!! The gorgeous lamp, candlestick, fish bowl and jug/tumbler from this photo of glassware have already been listed and sold over the weekend however the other items will be gradually listed over the next couple of days. 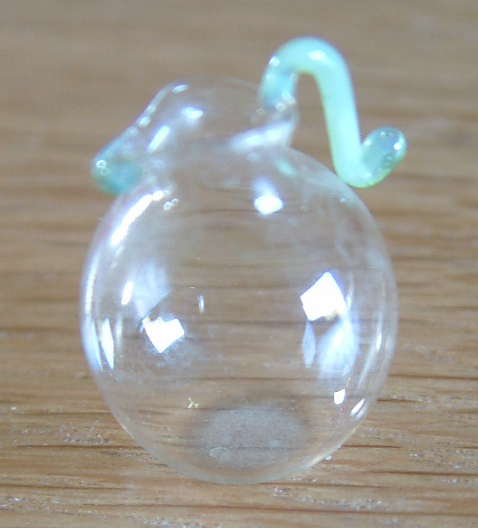 This amazing glass syphon with inner glass tube inside plus this pretty jug with green handle, are now available. These above are about to go up for sale over the next couple of days too....some are already listed such as these rare food cards. Marion's collection amassed over many years is massive and I've never seen so many variations of pianos, chairs, cookers, etc......all in one place. 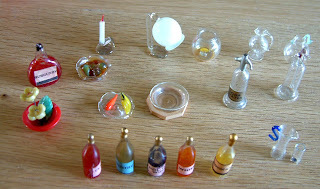 and am overwhelmed with them all....(I'm afraid I have reverted back to my childhood and just couldn't resist opening doors, pulling out drawers and frying eggs on the 1940s cooker-you know how it is)! This very serious art of playing takes time you know and helps in one's social, emotional, intellectual and physical development!! Hahaha...sorry, my nursery nursing training of over 30 years ago just popped up to the surface there......I digress. Ok....it is holding my breath and keeping fingers & everything else crossed time. 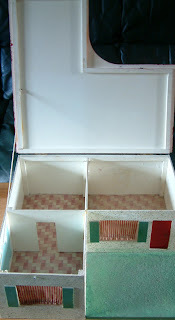 A lovely intrepid lady from the US who fell in love with two of my dolls houses, has spent a considerable amount of time (and money) in finding a suitable carrier who would ship out to the US. 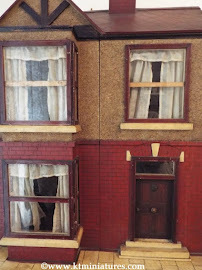 I have had such terrible problems in the past shipping dolls houses overseas that I took the decision a long while ago to put a complete stop on KT Miniatures shipping these large and fragile beauties outside of the UK. My nerves couldn't stand it - or my bank account - insurance was a joke! 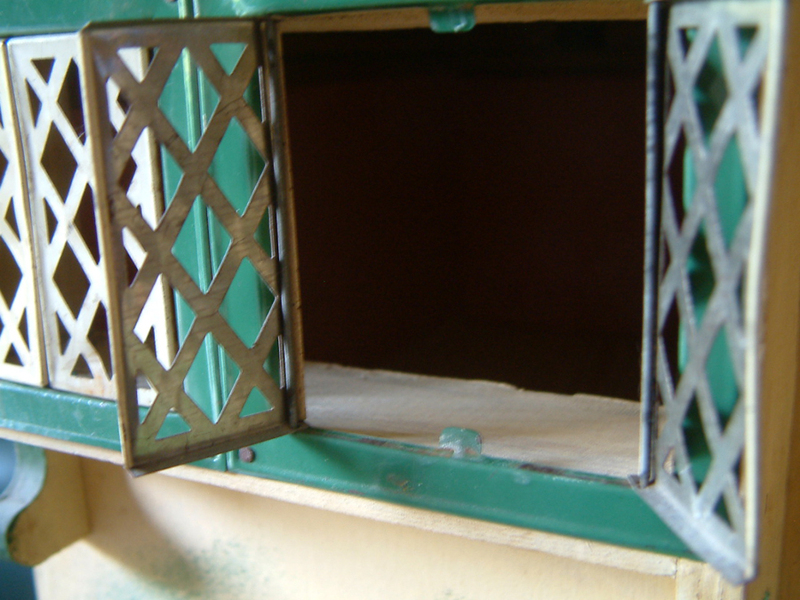 If this courier does a good job (they have offices in UK & USA) then this could offer an opportunity for those of you who wish to ship a dolls house (or two) overseas. They are expensive but if they do the job well then surely it is worth it. I would be fibbing if I said that I did not feel a tad nervous as their van pulled out of my driveway this morning with two houses inside. So we shall see. So watch this space...........I will let you know. Rare Dol-Toi Bungalow c1966-1968...and The Marion Osborne Dol-Toi Collection! 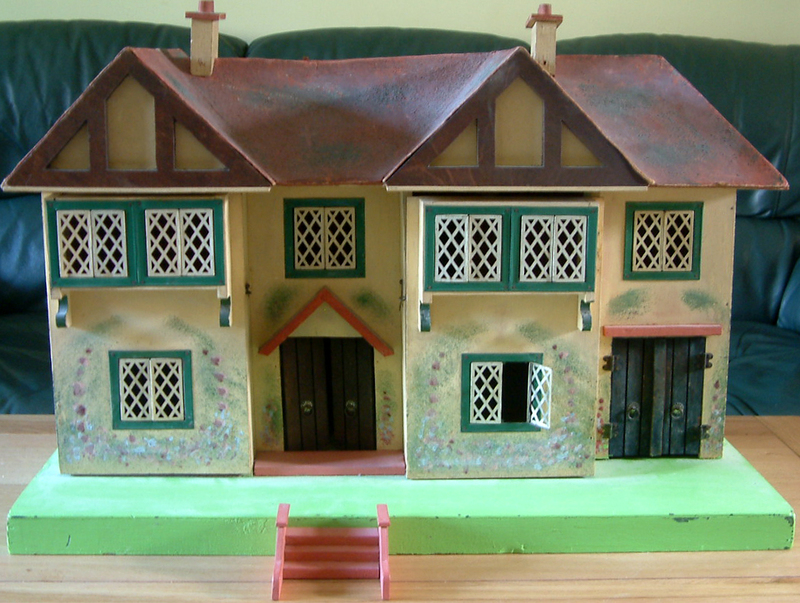 Once in a while, I have the task of selling an occasional small collection of vintage dolls house items; however it is not often I have a vast collection to sell, including quite rare items!! But yep folks, that is just what I have here.....and how very exciting it all is too!!! 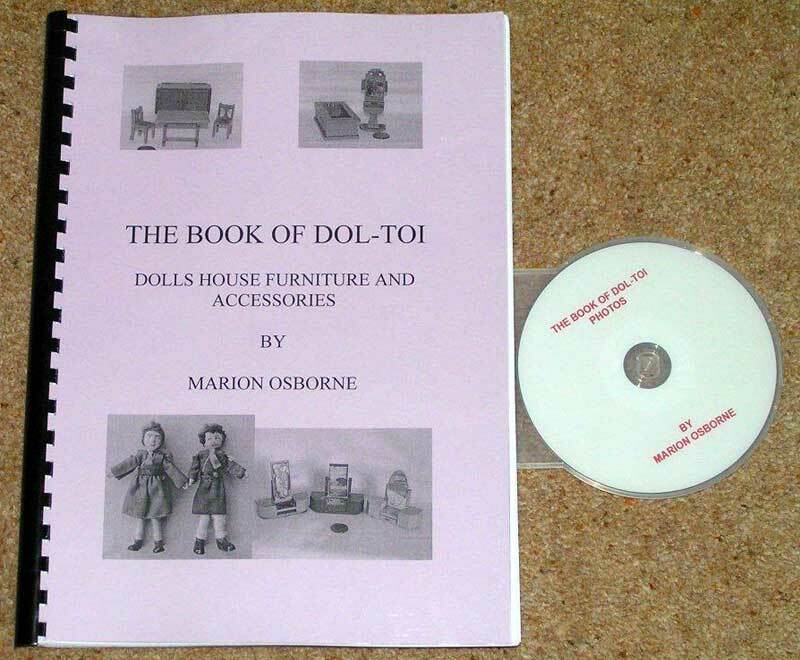 Marion Osborne has been collecting Dol-Toi dolls house furniture and accessories for literally years and years, all in the quest for research which culminated in her wonderful reference book, The Book Of Dol-Toi Dolls House Furniture & Accessories. 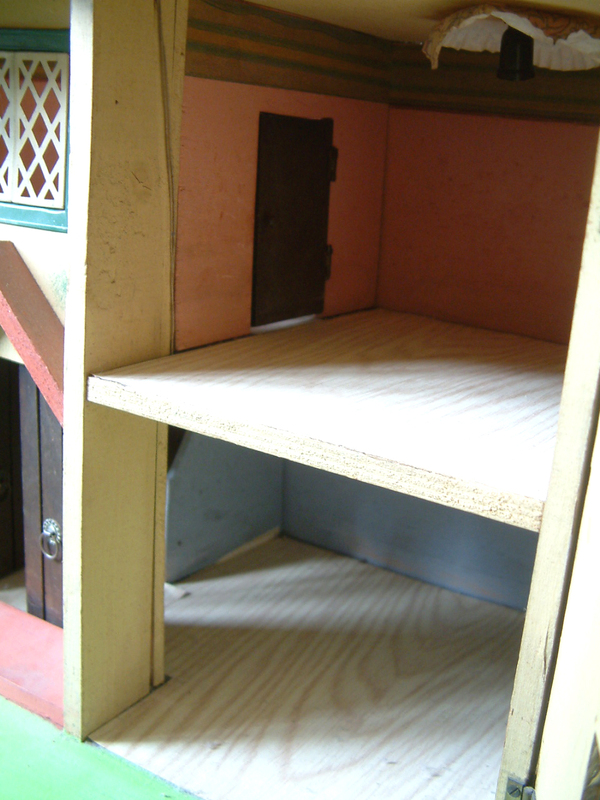 As the book is now written, the vast collection is beginning to gather dust and is all surplus to Marion's requirements. I feel very privileged although a little overwhelmed, to have been given the task to sell Marion's items on her behalf. Am not kidding folks.....there are boxes and boxes of wonderful little treasures here. It is going to take a while for me to sort out into some kind of order and begin listing but in readiness, all original KT Miniatures Dol-Toi stock (which did not amount much) have been taken off KT Miniatures Vintage Dol-Toi Page . Very shortly, I hope to begin listing all sorts of Marion's pieces on there, as and when I can. 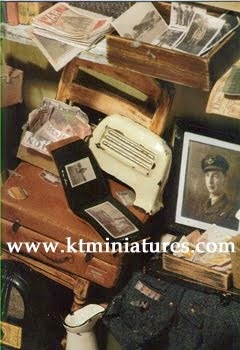 So please do keep looking....I will highlight the first batch on KT Miniatures Journal when the listing has gone live. Image Of Old Advert- Courtesy Of Marion Osborne's "The Book Of Dol-Toi"
In all my 16 years of trading, I have never handled one of these....needless to say, they are quite rare. 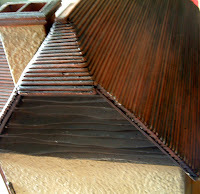 It is very simple in construction, made entirely from wood, consisting of three rooms with a hinged opening flat roof. 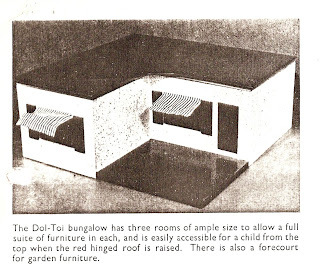 There is a front flocked "forecourt for garden furniture"....so it is described in an old advert. This is quite a nice feature and gives extra scope for display for the collector. Red striped material attached to a metal rod with hooked ends, slots into each window edge. Each window has green fixed shutters. 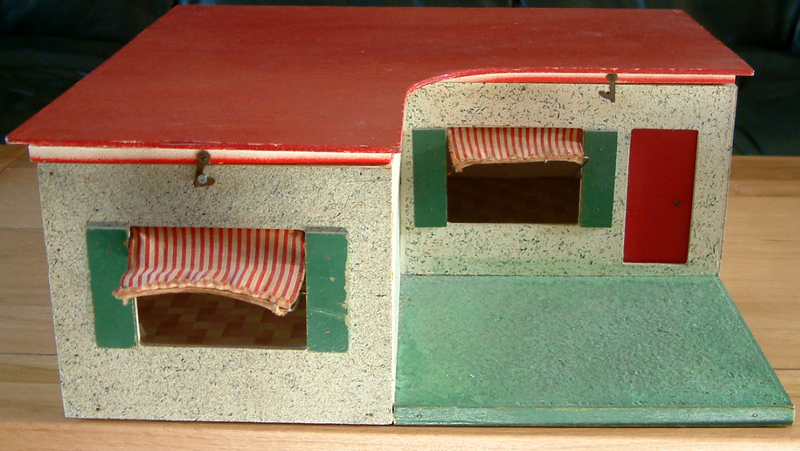 So there you have it.....a simple but rare and attractive little dolls house, quite evocative of the 1960s......a fantastic addition to any serious vintage dolls house collection. I am pleased to announce that Marion Osborne's two most recent reference books are now exclusively available from KT Miniatures. 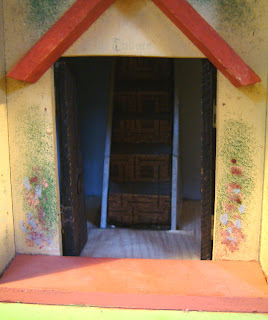 Her books are quite unique and filled to the brim with invaluable information to the vintage dolls house collector. 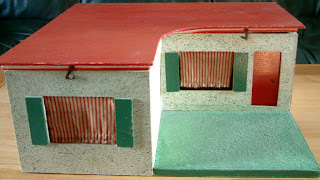 Marion's prime objective these days is to concentrate on writing more books and so consequently has passed over responsibility for distribution/production to KT Miniatures,(I understand that her next book in the offing is a book on Tri-ang furniture). A disk of photos accompanies each book and although the books themselves do contain catalogue pages for illustrations, please note that if you do not have access to a computer, you will not be able to view the photos on the actual disk. Every book with accompanying disk of photos is priced at £25.00 each plus postage and packaging. Each book weighs about 800gms so a bit pricey to post but will be well worth it and gauranteed to give much pleasure for years to come. 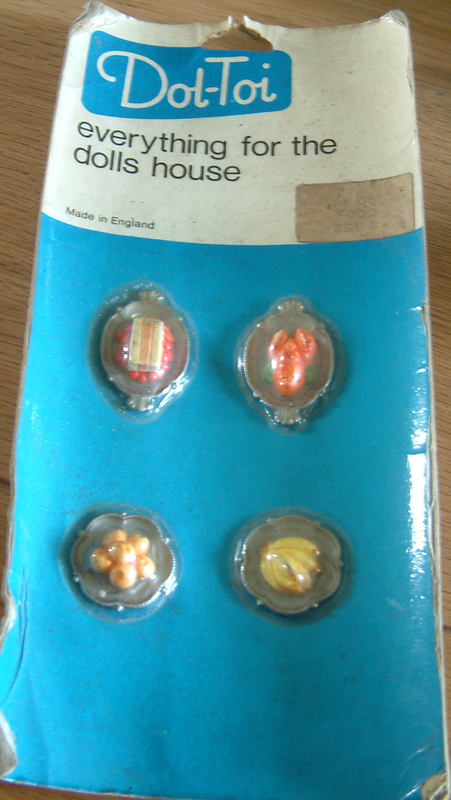 These books are unique and a 'must have' for any serious vintage dolls house collector. The last remaining book from the original three published many years ago, 1914-1941 A-Z Of Dolls Houses by Marion Osborne, can still be ordered direct from Marion. See my Recommended Reading Page for her contact details. Tomorrow....I have some exciting news of Marion's vast Dol-Toi collection.....so watch this space! Another dolls house has just gone up for sale today on KT Miniatures website....initially I thought it was what we call a "Dolly Mixture" dolls house but when I started to really look at it and photograph for listing, realised that it is actually different from any of the other "Dolly Mixture" dolls houses I have handled....such as no dormer window on the central roof, no diamond patterns on the front doors plus the gabling is constructed differently. 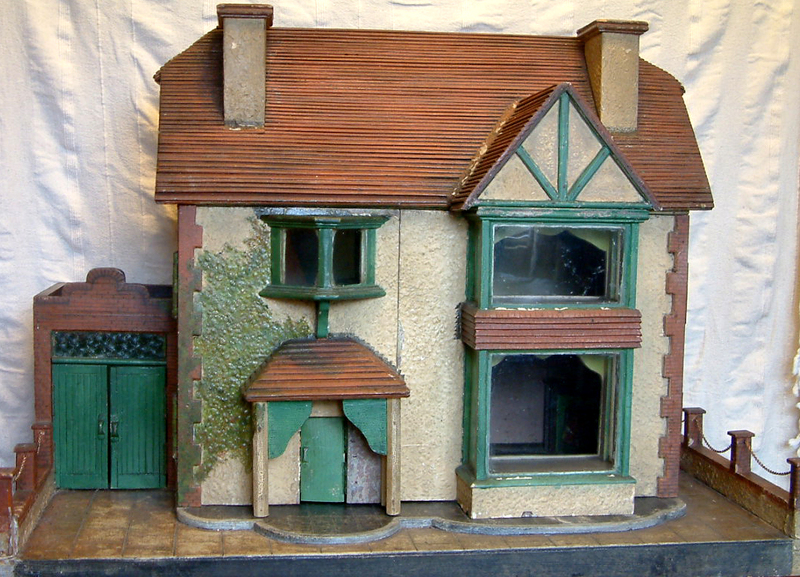 It does have some vague similarities to the Betal houses too but not completely, so....I am now just going to call it "A 1930s Dolls House". 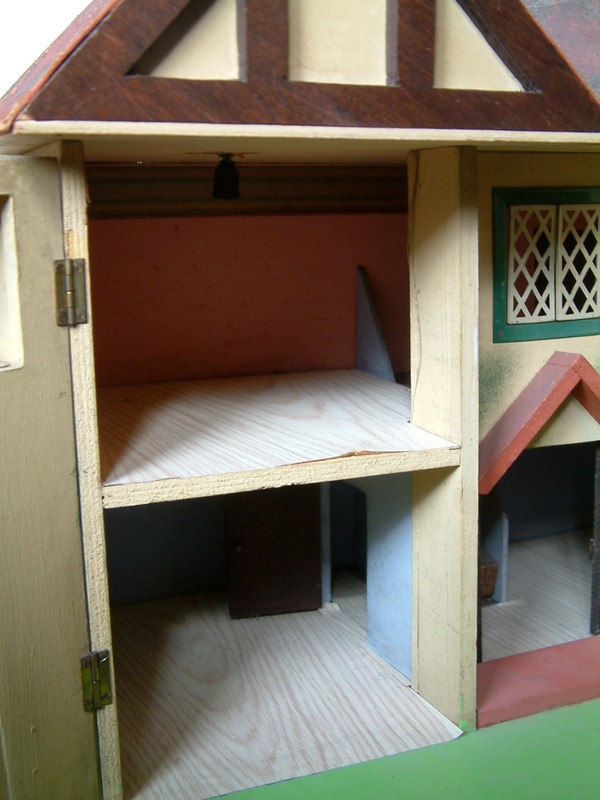 This dolls house has been much cherished and handed down a generation or two within the same family, but now time has come for it to embark on a new chapter. 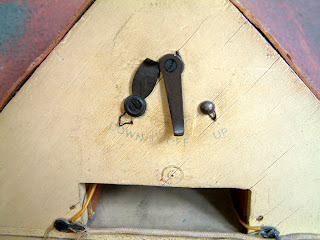 It is in a good played with and mostly original condition. The base has been overpainted in a light green but can easily be brought back to its original colour if necessary. 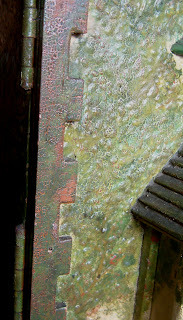 What is really nice is that there are both chimneys and steps....all of which are so often lost with these old houses. 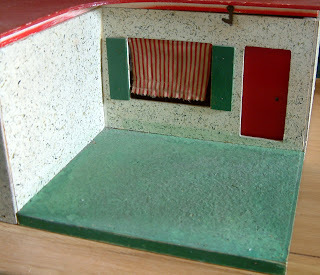 The painted foilage that was so commonplace on these vintage dolls houses is very pretty and nicely done. This has four rooms with two internal opening doors. 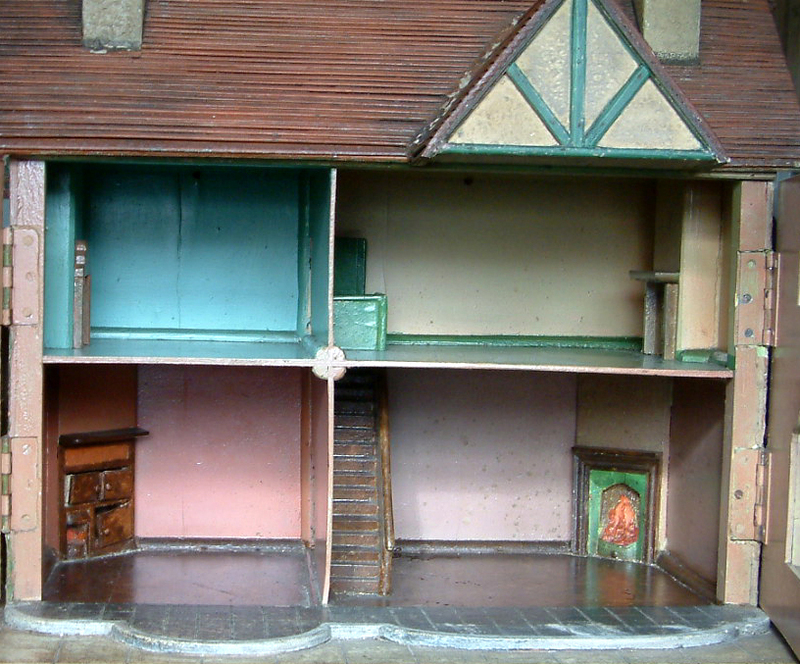 The walls are in original colours plus the upstairs rooms have an upper border too. 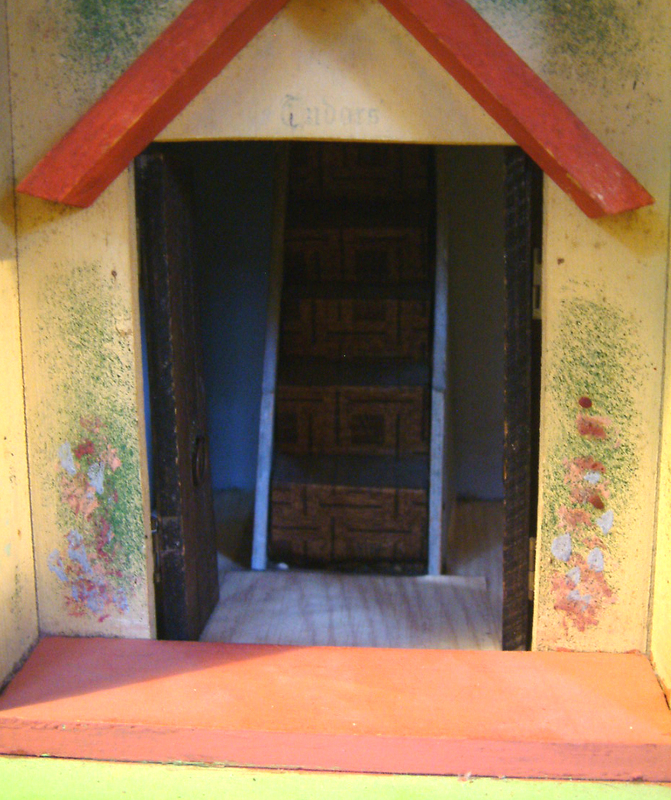 The stairs run up the centre of the house and can be seen through the double front doors. 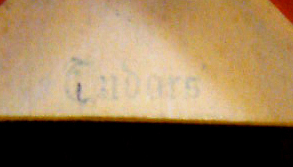 It was not until I started photographing that I realised that there was a very faint stencilled name above the door....but for the life of me can't fathom out exactly what it says.....well I do and I think it says "Endars'" but this does not make sense! There are more stencilled words around the lighting switches (see further down) but clearly in English, so my theory of it being a foreign name/word can be dismissed. Anyone any ideas? 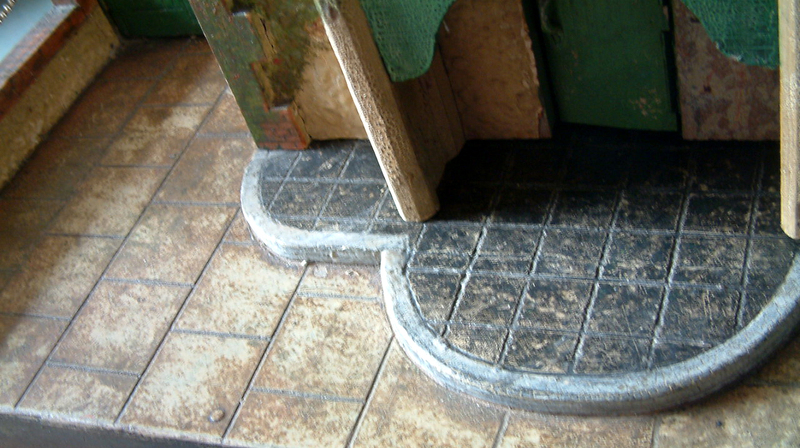 The floors have been covered in sticky back wooden effect flooring but the original flooring may well be lurking underneath. Note the vintage paper cake cases as lampshades....fabulous! Battery compartments are located at the rear with original switches. There is some wiring but I have no idea if the system still works. 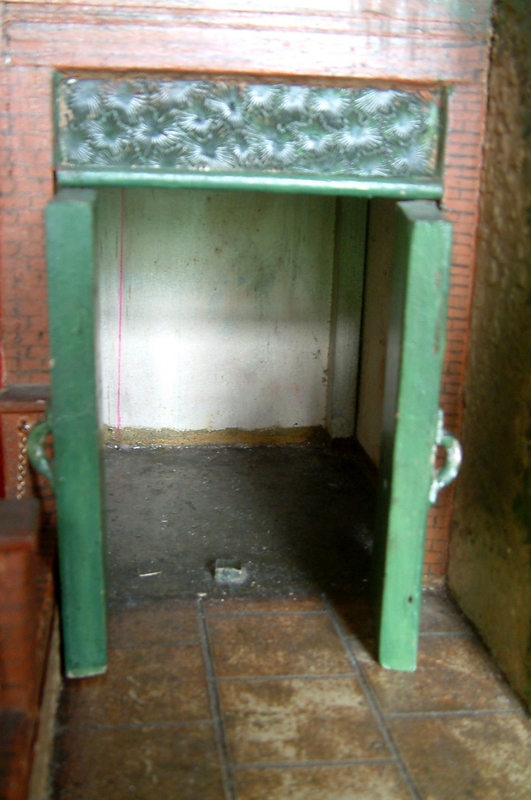 The spacious garage has a pair of double doors with the same metal handles as the front doors. 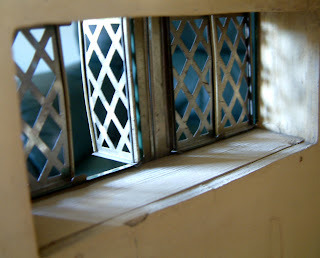 Then there are these wonderful pre-war Romside metal windows. 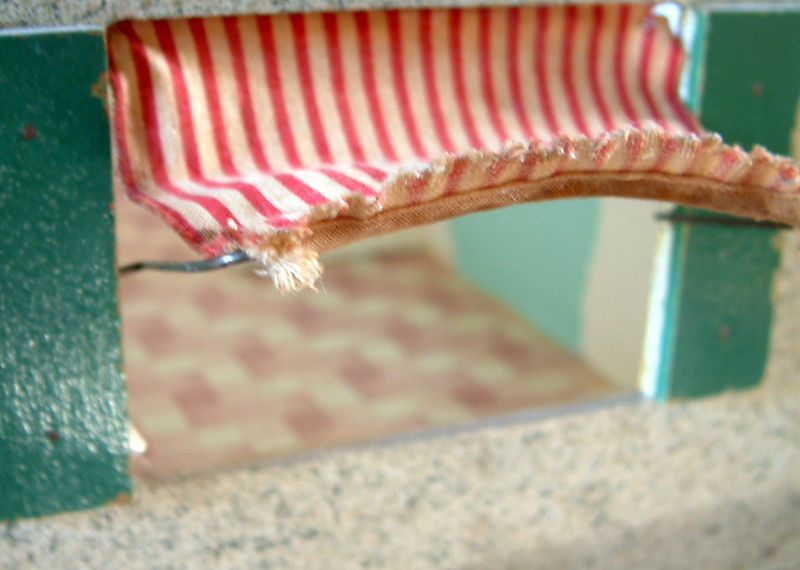 Unlike the post war version that have metal tab hinges and handles, these 1930s windows have metal rods down each side to act as a hinge plus no handles. 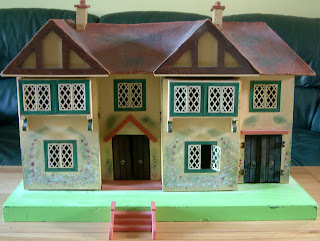 This is a very sweet dolls house in 1/16th scale, doesn't come along very often and is in need of a new home. 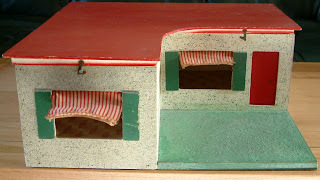 Back From Travels - A Rare c1920s-1930s Dolls House! 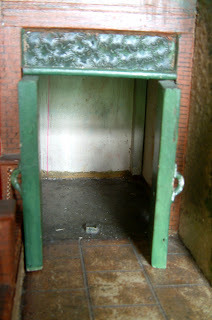 Well.....after several days of dashing up and down the country picking up stock and meeting some very nice people, am finally back from my travels ready to burst forth with loads of lovely vintage goodies on KT Miniatures! To begin with, there is this rare dolls house....I think you'll like it. 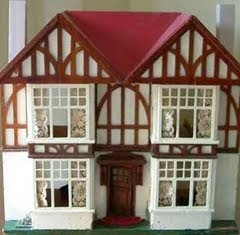 Just gone up for sale this afternoon, an unusual and quite large c1920s-1930s dolls house. It is beautiful!!! 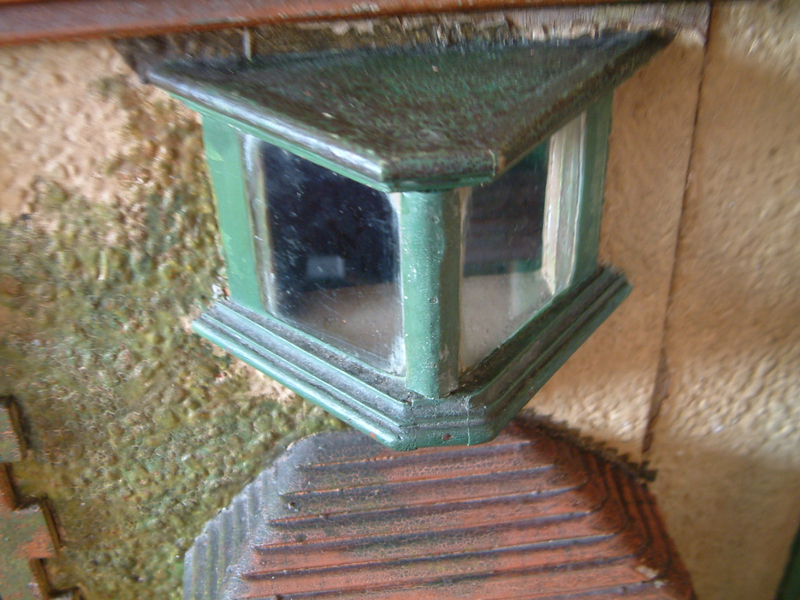 There are some real quirky details and this house simply oozes character. 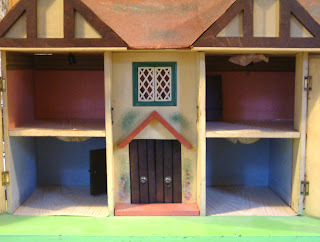 It consists of four rooms, with staircase, two interior doors and built in fireplaces plus a kitchen range. All windows are fully glazed with real glass.......and just look at this oriel window! So very evocative of the 1920s/30s era!!! 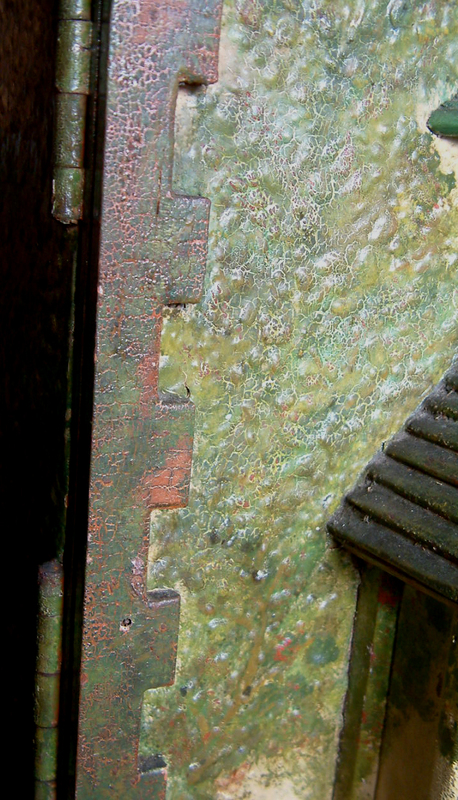 Textured glass is incorporated into the handpainted brick frontage - all very art deco in shape and style. The panelled garage doors open to reveal a very spacious garage interior....just think what you can put in there! 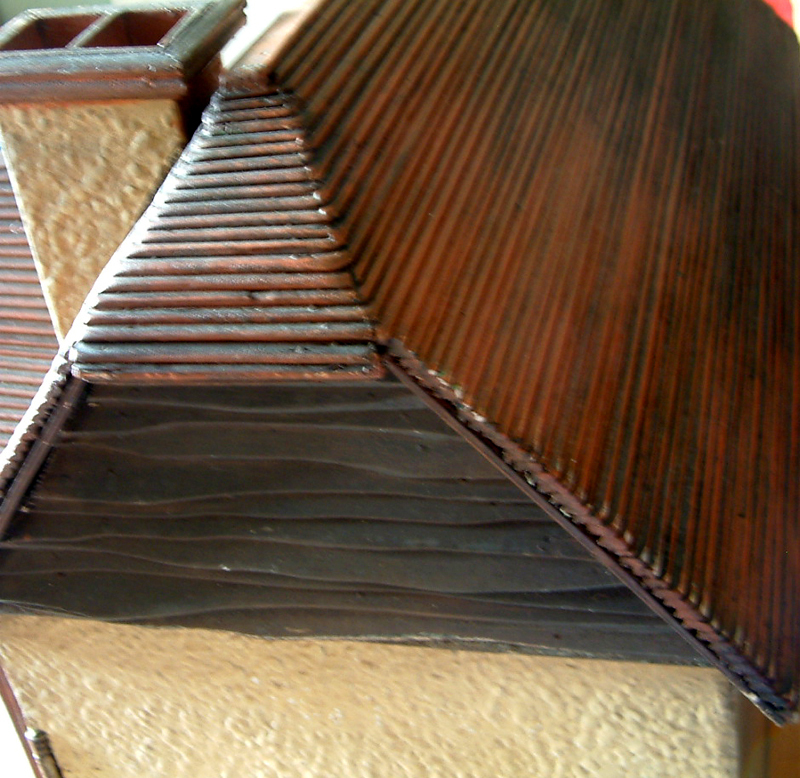 The Tudor styled gabling, the wonderful slatted roof, weatherboarding at each end plus some magnificent chimneys are some more of the rather lovely features to this house. 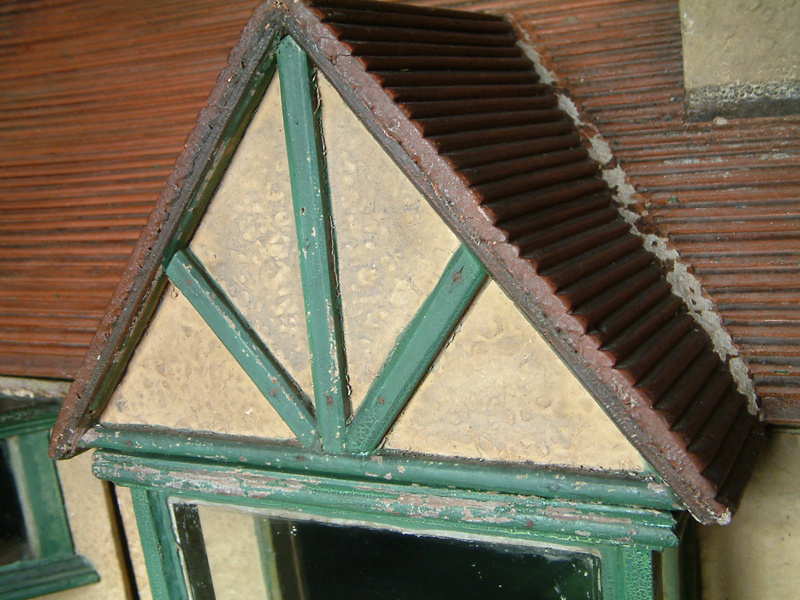 Maker is unknown but the creator has incorporated some glorious shading on the roof and quite professionally painted foilage in parts. 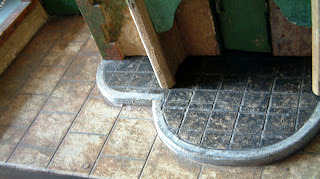 Then there is this attractive paving....two different colours and types. 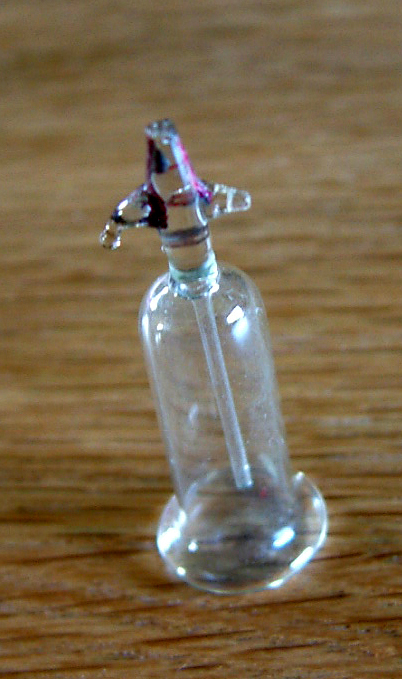 I have not seen any quite like these before but very cleverly done. 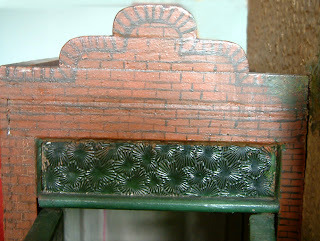 Each end of the house is bordered by handpainted brick effect pillars with chains strung across......the hooks were there but the chains had long gone so I strung pieces of vintage chain across and aged a little with burnt umber paint...can easily be unhooked if necessary. 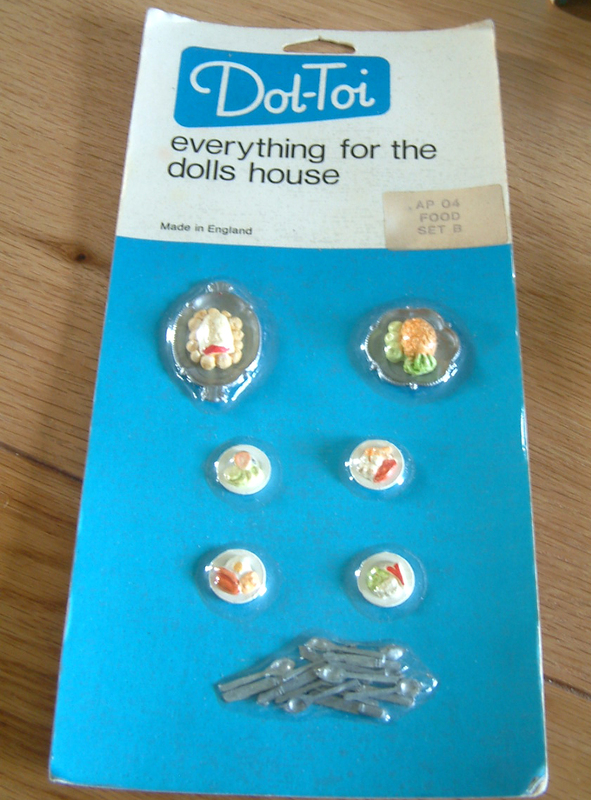 Also just come in is a 1930s Dolly Mixture dolls house. But more about that tomorrow. 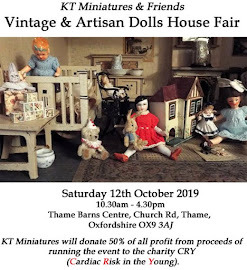 If you are wondering why KT Miniatures Journal has been a little quiet for the past few days......don't worry....am still kind of around but dashing here and there gathering some lovely vintage stock, amongst other things. Have been meeting such wonderful people. 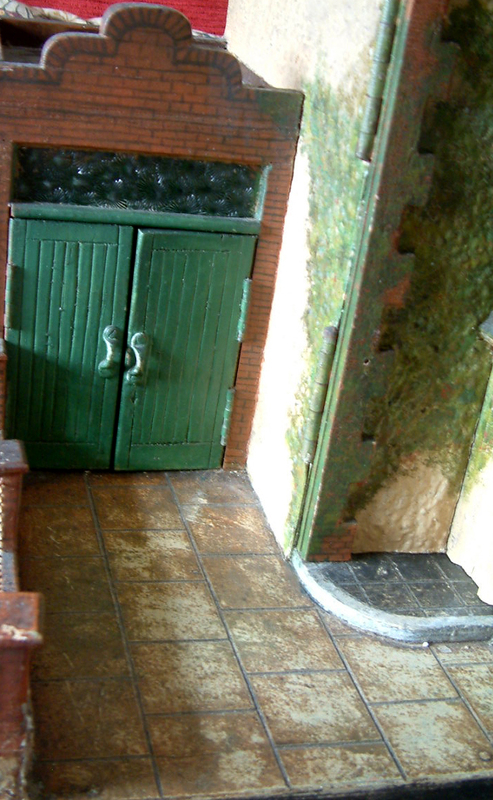 Plus I hope to bring you some news next week concerning a new development for KT Miniatures. Small snapshop of Gloucester Cathedral! 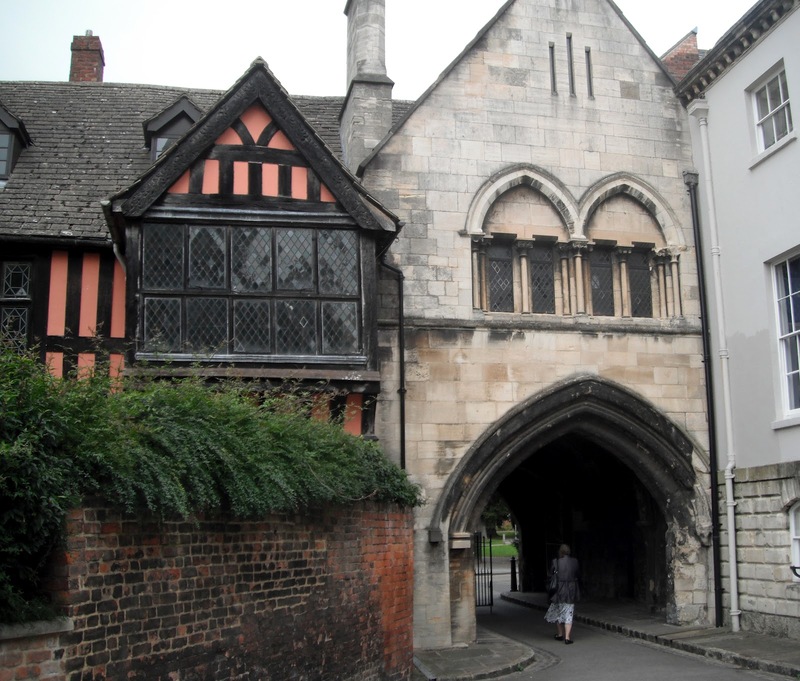 Some of the wonderful old buildings to the side of the cathedral. And then admidst all this, on the spur of the moment, we zoomed off unexpectedly for a short break last weekend in the Cotswolds with some lovely members of my family. I can strongly recommend it! However, having been born and bred in Gloucester, it was so surreal to visit the place as "a tourist" and do the sort of things that tourists do in Gloucester! Was a right real trip down memory lane I can tell you and it didn't take long for me to slide right back into my Glos accent!!! The Gloucester dock area has changed quite dramatically over the years and has quite a buzz about it now. 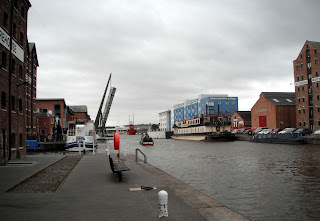 Although the wonderful old antique centre is now long gone, there is a brand new one in another part of the docks and well worth a visit.